Post subject: Re: elmer's glue? Hmmm.. and if you don't press it under the books what happens? You mean is DOESN'T work if you don't use the books???? I NEVER have to use books to press on the racket when using Elmer's Rubber Cement. It just sticks. Never had to do it with water-based table tennis glues, either. Elmer's RC is much more fast drying compared to Elmer's clear school glue . The key to my method is : spread very thin layer of glue uniformly on both the sponge and the blade ( i.e. using a discarded credit card) then press down the rubber onto on the blade to assure completely full contact to solidify the bond . I also use electrical tapes around the edge and on the rubber as seen in the enclosed photo . This way further secures the rubbers onto the blade around the edge . 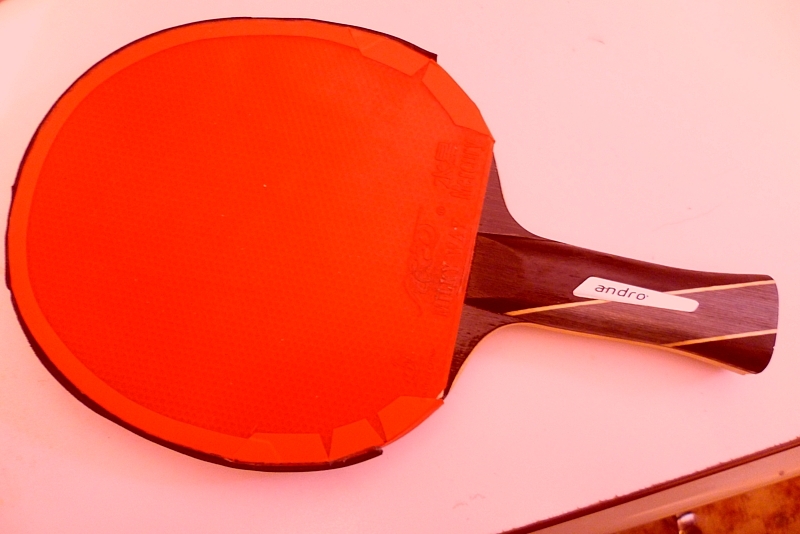 I also add a sponge edge tape to protect the paddle against accidental contact with the table . The overall additional attachments ( i.e. electrical tapes + sponge edge tape ) add about 4 grams to the weight of the paddle . Note that I play for pleasure so ITTF rules should not be a concern for me as far as edge tape is concerned.. The washable school glue might indeed behave differently than the old Elmer's White Glue. If you apply the old Elmer's Glue to a piece of wood and allow it to soak in an dry it will NEVER come off, since it's meant for gluing pieces of wood together. The Washable School Glue might behave differently, but I'm not going to try it. It's not available everywhere here, like it would be in the US. Exactly. White glue will destroy it. And for the Washable School Glue...the big question is... WHY? I can't see how it could get better than RC is right now, which is perfect except for the VOCs which I could care less. But if it works, it is viable in comparison to Water Based TT glue, because the cost is considerably less. And it's cheaper than Tear Mender. So that I can see....but still seems inconvenient. Last edited by Japsican on 09 Feb 2019, 02:04, edited 2 times in total. Cost is a non-factor here in the US. IT's a few cents difference.... ($1.99 for 4 oz of RC vs. 1.79 for 5 oz of Clear glue at Target). Still unknown if you RE-glue the rubber without applying more glue to the rubber. RC does not need this. Hasn't been tested long term for effects on blade and sponge. I always peel off the old glue from the sponge & the blade before re-gluing . It comes off very easily . I hate the smell of rubber cement and avoid using it at all cost . It's a personal preferrence. BTW, if you apply a very thin glue layer, one hour of weight pressing down the rubber is good enough . So far, I apply my method on 8 blades and they work fine . Yeah, rubber cement is more expensive, it costs somewhat more here, too. But I buy the big half pint bottles and use those to refill the small one with the brush. Cheaper that way, and the glue doesn't get a chance to become thicker in the small bottle (which it will before you get a chance to use all of it). I get most of the above, but why would a VOC based rubber cement be a problem when gluing Tensors in particular? I've done it with several sheets, haven't had any problems at all. Depends on who you talk to and the rubber. Butterfly and ESN explicitly state you shouldn’t use RC or else it somehow is detrimental to their spring sponge/tensor rubbers. I agree with you that it’s no big deal, but I have noticed far more shrinkage on re-gluing when RC is used on tensors. I actually did a test with 2 sheets of Xiom Vega Europe... one rubber with WBG and the other with RC. There was more shrinkage on re-gluing, not a ton, but it wasn’t negligent. For this reason, I do the method where I use WBG on the tensor and RC on the blade. If not a tensor, then RC both surfaces. All tensor shrink some, but it does seem more so if RC is put directly on the sponge. I have only done the direct comparison once though.